Successfully Added Mfox A10 Pro Gold Rugged Smartphone - 2.37g Au750 Gold, 6 Inch 1080P Screen, Android 5.0, 4G, Altimeter to your Shopping Cart. The famous rugged smartphone manufacture — Mfox — is out with a new model, the Mfox A10 Pro Gold.This phone will really turn heads with its Au750 gold badge, camera lens and speaker surround it's got some real bling and comes it its own wooden presentation box. The rugged smartphone also comes with a large 6 inch display, 4G connectivity, Android 5.0 and lots of other great features. The Mfox A10 Pro Gold rugged smartphone is a one-of-a-kind device, especially when it comes to rugged phones. Not only does it have a huge 6 inch display with 1920x1080 resolution, it also sports Android 5.0 and extensive network coverage: 2G: GSM 850/900/1800/1900MHz, 3G: WCDMA 850/900/1900/2100MHz 20. TD:B34/B39 and 4G:FDD B1/B3/B7/B20; TDD B38/B39/B40/B41. Powered by the MTK6752 Octa Core 64bit CPU and with Mali-T760 GPU, it is well equipped for multitasking, gaming and more. With Bluetooth 4.0, it sports quick connectivity with other devices and with Google Play support, you can always get more apps and games for your phone. With 32GB of internal memory + 32GB more supported externally, you will have lots of storage space. TheMfox A10 Pro Gold comes with a solid build and a truly unique design: a strong rubberized exterior is adorned by elements with Au750 gold and is really resistant to the elements. With IP68 rating, the smartphone is absolutely dust tight and can even be submerged in water. Made with outdoorsmen in mind, the smartphone also features internal GPS + AGPS, pedometer, altimeter and even a magnifying glass function. 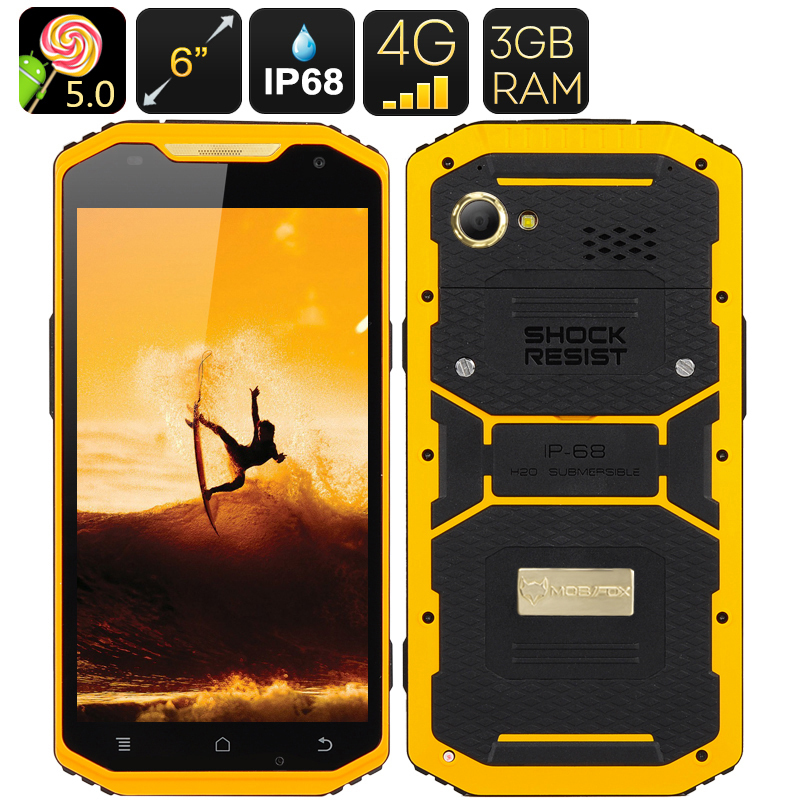 The Mfox A10 Pro Gold Rugged Smartphone comes with a 12 months warranty, brought to you by the leader in electronic devices as well as wholesale Android rugged phones..